The industry organization AIIM issued a press release this week about the work they conducted through a task force of the leading vendors in enterprise content management (ECM). For the task force, AIIM recruited Geoffrey Moore, the renowned business analyst and author of business classics such as Crossing the Chasm and Inside the Tornado. 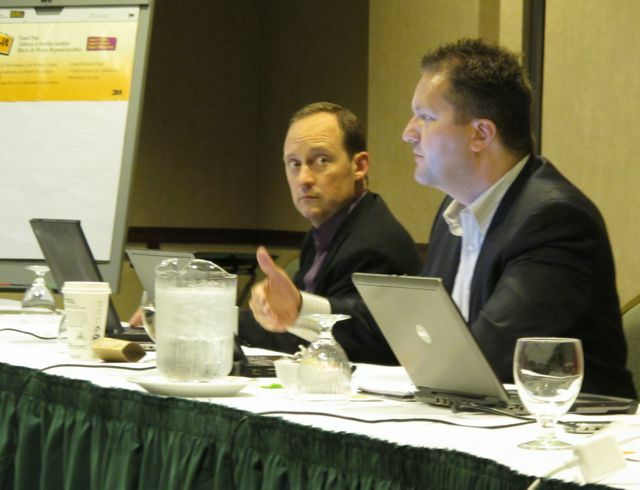 I have been fortunate to be part of this task force, working with Geoffrey, the folks from AIIM and my peers from all the key players in the content management industry. The challenge at hand was to formulate a strategy for ECM in light of some of the disruptive changes the industry is going through. Basically, there is a lot of content being created, shared, and even stored today, that is considered outside the scope of traditional content management applications. This content is the result of online social interactions between people – just think about all the interactions happening on Facebook or Twitter. We are posting comments, exchanging messages, sharing pictures, video clips, and other content assets. While none of us think of content management when we do so, we are effectively creating and sharing content – and that is the essence of content management. Together with the task force, Geoffrey has formulated a concept that includes the definition of the Systems of Records and Systems of Engagement. The Systems of Record are some of the traditional use cases for ECM, including compliance, archiving, and records management, while the Systems of Engagement include the more end-user facing applications based on web experience, media management, and social media. Check out the findings on the AIIM web site. This is very much in line with Open Text positioning. 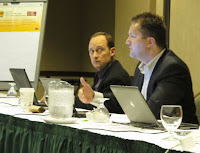 We talk about content lifecycle, transactions, and engagement as the key areas of the ECM Suite 2010. In fact, we are well along the path of convergence between the Systems of Record and Systems of Engagement. The Systems of Engagement require the services of the Systems of Record to be enterprise-ready – they need security, compliance, and archiving capabilities. The real issue at hand is the definition of ECM going forward. There is clearly a need to expand that definition to include additional types of solutions and capabilities to address the “consumerization” of the enterprise and its impact on enterprise content management. I am excited that the AIIM, as a non-profit industry organization, is taking on the leadership role in this endeavor. After all, the goal is to grow the pie because if the pie grows, every slice gets larger. 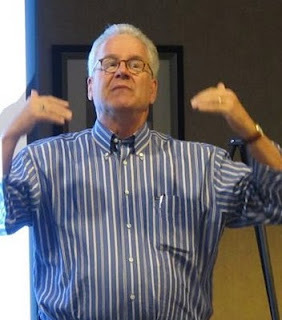 Images: Geoffrey Moore and the AIIM Task Force. There is an interesting shift in ECM to be sure. As with other points in the technology timeline be it the PC revolution, the cellular telephone or the electronic gaming industry will it be the current technology giants that innovate or will it be the relatively unknown or startup companies that push the envelope? I believe the established ECM vendors will have a more difficult time making this shift. They have legacy customer bases and software platforms that must be taken into consideration when planning future versions or features. They are also typically focused on M&A, Stockholders and existing strategic partnerships. Therein lies the problem. Most large software vendors aren't agile enough to make a giant leap forward. Of course some big companies do retain the innovative roots from whence they came. Apple has surprised everyone the last few years with iEverything and Microsoft created lots of hype and splash with $harePoint but I would keep an eye out for dark horse companies that you may have not considered or even heard of. Even if those companies don’t become the next FileNet or OpenText they will likely have more to do with innovation and moving the ball forward than the well known legacy ECM vendors. I absolutely agree that leaping forward is an issue, but I also feel that AIIM is as slow to leap forward as big companies. I raised the issue with the definition of ECM almost a year ago, but the kneejerk response was that the def of ECM was just fine. While OpenText has definitely been a leader in thinking about change, other industry leaders (companies and individuals alike) are slow to understand new technologies like social media and their impacts on corporation. Best of luck in the new definition...I'll be interested to see whether tweets, instant messages, SMS text messages, and status updates are addressed.